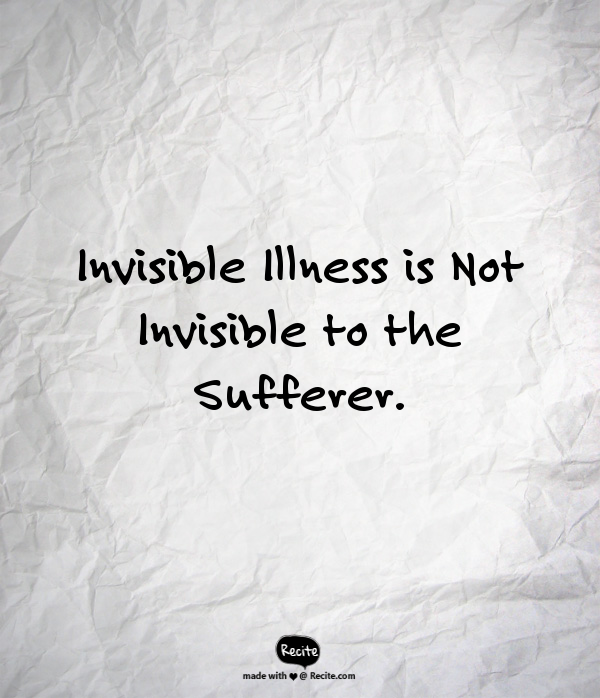 Depression is an invisible illness, but it has real mental. emotional and physical symptoms. Feelings like sadness, and grief are felt in the body. Depression is physically painful. If you are suffering from depression, you are not alone. But there is still a feeling of being alone and isolated. Interacting with other people can be stressful and draining. It can be difficult to find someone to talk to that understands what your daily life is like. Depression is different than feeling sad about something. This is a common misunderstanding. People know they have felt sad before, and they do not understand the difference between that and what you feel. There are physiological changes in the brain, in the depressed person. It is hard to know what came first with any given person. Abuse, trauma, and feeling hopeless in an intolerable situation can cause changes in the chemicals in the brain. This is a common neurological phrase. The brain has plasticity, also called neural plasticity. The neural pathways wire together based on thought patterns, and behaviors. This is how we learn new things and also how we develop habits. Good habits and bad habits are both wired into the neural pathways. Thought behaviors and negative thought patterns can be wired into the neural pathways of the brain. Changing thought patterns can be very difficult. The chemical reaction to changing thought patterns can feel like withdrawal from a drug. Self destructive thought patterns can develop from having to live in traumatic situations. struggling to survive in poverty is one situation that is often discounted. Having to work at a job you hate for an on-going period of time can also create negative thought patterns that become wired into the neurons. Living in abusive , chaotic or otherwise traumatic childhoods or teenage years can program thoughts if being a failure, hopelessness and worthlessness. Emotionally neglected or abused children carry low self esteem, which sets negative thought patterns into the brain. Your situation is unique, but it can be helpful to connect with your inner child, and any fractured parts of you that were traumatized. C-PTSD is complex post traumatic stress disorder. It happens when someone is in an intolerable situation that they see no way out of. There is a feeling of being imprisoned in a threatening, painful life. Even after getting away from the originating trauma, the Complex Post Traumatic Stress Disorder continues. Many people with depression are suffering from C-PTSD and do not know it. It can help you to heal, if you discover the root causes of your trauma and emotional wounds. Society and the system seems to be re-traumatizing us by making us think we should feel shame and guilt. Media teaches fear and anxiety as a way of life. Blame is a subliminal message is advertising and propaganda. That makes healing difficult. Emotional wounds to the psychological self can run very deep. It may even be a kind of soul wounding. The wounds need to be given attention, in order to create new thought patterns. People with C-PTSD will often fall back into depression even after getting better for a period of time. It is your emotional body is in pain, then it is calling to you for attention. Ekart Tolle calls this the Pain Body. He teaches us to observe the pain body and accept it’s presence, when it appears. Seeing the Pain Body as an entity in itself, which is also part if us as a whole, can help to deal with it. He teaches that we resist our pain body due to some kind of resistance to ourselves. Self judgement, shame and guilt can cause us to hold into pain. We sometimes feel that we deserve the pain. This may have been programmed into us. But in order to get out of depression, we have to let go of self judgement. If you have PTSD , you might find that you are having physical reactions to the stress and you are sick more often. PTSD can cause a variety of problems that come from interference with the normal functioning of your immune system. The DNA in the group with PTSD showed a significant increase of a gene that made them more vulnerable to multiple types of sicknesses. One particular gene, called the unmethylated gene, was more abundant in PTSD patients than in non-PTSD patients. If you noticed that you became sick more often after going though traumatic ongoing abuse then it was not all in your head. Your immune system was compromised by the PTSD. Personally I ended up in the hospital and / or the ER repeatedly after my abusive relationship. Soon after the relationship ended, within a couple of weeks, I got a severe intestinal infection and I was admitted to the hospital after spending 4 hours in the Emergency Room to stabilize my blood pressure, which had gone down to 69 over 42. After that hospital stay I was week for a while and then got back on my feet again. In another few weeks I had a relapse of the intestinal infection which was treated with another round of Cipro antibiotics. The a few weeks later I began to feel very ill. I was afraid the intestinal infection had come back. I was vomiting this time, which had not occurred before. I had a fever and sweating. I was very sick and by the time I dragged myself to the ER I could hardly walk. They gave me a CT scan on the hospital and they determined that it was not an intestinal infection this time, but a severe kidney infection. The kidneys were filled with bacterial infection and if I had not gotten myself to the ER I could have died. The doctors did not understand how someone my age could get two unrelated infections so close together. The infections were in different organs and both of them were severe and life threatening. I suspected that my immune system might be crashing but I did not think the doctors would believe that PTSD was causing this, so I did not bother to say anything. I decided to research this after I became better from the illnesses. It was a slow and painful road to healing. Men who return from combat zones end up with PTSD and a variety of physical illnesses. Research has been done and is still being done about the reasons for immune system crashing after a person experiences trauma. “This is the first time that it’s been shown that men and women respond differently to PTSD on a very basic biological level.” Lynn Pulliam, MS, PhD, chief of microbiology at SFVAMC and professor at UCSF. People with PTSD are more likely to develop heart disease and other cardiovascular diseases. There is too much stress on the heart and on the entire biological state of the body. They also have an inflammatory response which causes an increased risk of early onset severe arthritis, which can eventually become debilitating. Arthritis is a painful condition which is caused by inflammation and eventual deterioration of the joints. The brain of someone with PTSD has biological changes in the neural pathways and the way the sympathetic nervous system handles stress. The normal functioning of the system is damaged due to the “fight or flight mode” being activated for too long. During a situation of threat and perceived danger, the sympathetic nervous system does its job to try to alert you. THE AMYGDALA IS RESPONSIBLE FOR ACTIVATING THE ALERT SYSTEM DURING A THREATENING SITUATION. IT IS NOR DESIGNED TO BE TURNED ON FOR AN EXTENDED PERIOD OF TIME. “In individuals with PTSD, the HPA axis response is dysregulated. Individuals with PTSD have low circulating levels of cortisol. PTSD is a very real mental disorder and it can cause the sufferers to have a much lower quality of life. It affects all aspects of a person’s life including social life, family life, work life and romantic life. PTSD can interfere with a person’s ability to perform basic daily tasks and even to take care of their personal grooming and other needs. PTSD is painful and frightening. The memories of the event linger and victims often have vividflashbacks. Frightened and traumatized, they are almost always on edge and the slightest of cues sends them hurtling back inside their protective shells. PTSD CAN GREATLY LOWER THE QUALITY OF LIFE THAT THEY PERSON IS ABLE TO HAVE. The reality that the immune system becomes compromised adds to the problems. The combination of mental illness and physical illnesses can cause the sufferer to lose all hope and feel that their life is worthless. More research is being done about PTSD, and hopefully there will be more information about this disorder. If you suffer from PTSD, know that you are not alone and there is hope. The best thing is to find someone to talk to about your feelings, who has a frame of reference to understand what you are going through. Since PTSD is invisible, it is often difficult for people who have not experienced any kind of mental illness, to understand it. YOU ARE A VALUABLE PERSON WHO HAS BEEN AFFLICTED WITH THIS DISORDER. It is not through any fault of your own. It is easy to lose hope and to feel like self isolating. Being alone all the time can cause more problems with loneliness and depression. If someone is triggering to your PTSD then try not to spend much time with them. In the mean time reach out and find a few people that you can talk to that validate your experiences and feelings. There is no reason to suffer alone. If you cannot find anyone to communicate with, there are many people in the blogging world and support groups on the internet where you can find some support and relief. Blessings for peace of mind. On Thursday you are invited to connect with all of us here. Thanksgiving is the first of the holiday season and can trigger depression and anxiety in many people. Others are feeling lonely during the holidays. If you are feeling alone or just want to connect, you can come here on Thanksgiving. I will create posts during the day that you can leave comments and also leave links to your own posts. If you have posts that you want to post the links to, you will see posts you can put them in the comments section of. Artwork, poetry , details of what you are doing or how you are feeling are all welcome. Everyone is encouraged to leave kind, thoughtful comments on anything that others leave. Depression and lonliness can exist together, but they are not exactly the same thing. Lonliness is something experienced by all people at some point but it is not always accompanied by depression. Usually lonliness is thought of as occurring in solitude but this is not always true either. Some people experience lonliness in combination homesickness , when they are away from familiar people and surroundings. They can feel this even when there are people around. Depression can also develope out of childhood abuse. This can be any type of abuse, including emotional and psychological abuse. People that were abused as children often have complex post traumatic stress disorder as adults. Many people who have mental illness like depression, anxiety disorders, bipolar disorder and borderline personality disorder had chaotic, traumatic, abusive or emotionally devaluing chilhoods. Some people are unaware that they had any abuse or emotional trauma because it happened at a very young age. The brain stores memories differently before the age of 5.